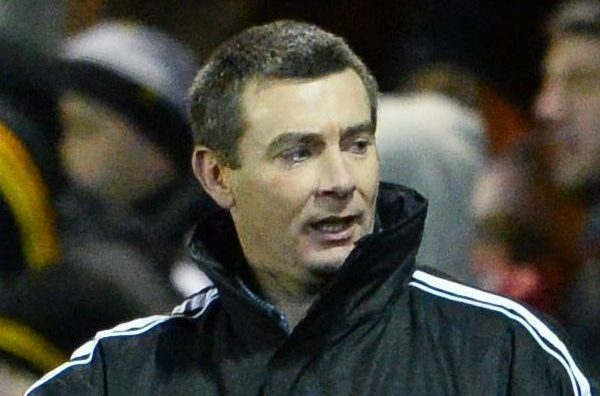 Brechin boss Barry Smith is hoping Tuesday night’s late postponement of the game against Stranraer will work in his team’s favour as they face Montrose in a crunch Angus derby this afternoon. The initial fixture at Stair Park was called off in December because of a flooded pitch but this week, high winds caused the cancellation. By the time Brechin received the news, it was too late for their bus to turn back and the players and officials then had to endure a frustrating wait in Stranraer as the driver took his mandatory break. However, while disappointed with another long, wasted journey, Smith is hoping it will ultimately work to their advantage against the Gable Endies as Brechin look to pull away from the League 1 drop zone. The manager said: “We were 15 miles from Stranraer when we heard the game was off but there is nowhere to turn on that road so we had to continue to Stranraer. “By that time, the driver had to take his 45-minute break so we had to wait before coming all the way back up the road. “It is difficult because they can’t call a game off on a forecast or in anticipation on what is going to happen but when you are having to travel that distance there has to be an exception to the rule. “The other problem is that guys are going in and asking for time off work and they are going to have to do that again because of the rescheduled match so I just think there has to be a bit of common sense there. “Hopefully though it works in our favour as we had played three games the previous week but the boys looked really fresh at training on Thursday night. Dene Shields, Jordan Sinclair and Callum Tapping will miss the game through injury. Meanwhile, Montrose may have lost three games in a row but if they are searching for a good omen, the last time that happened they won their next fixture – at Brechin. Gable Endies boss Stewart Petrie is still looking for his side to make their League 1 safety a mathematical certainty but after their recent poor run they are now just seven points in front of their Angus neighbours and Stenhousemuir who occupy the bottom two positions in the table. Now, Petrie is hoping that barren spell will finally end at the Glebe – just as it did back in October. He said: “Yes, that would be nice but we know we still need to win some games yet and there is a lot to play for. “We have three big games coming up and hopefully we can take points from them if we are at it. “But we are fully concentrating on Brechin first and foremost. “Barry will have his boys fired up for it and it certainly won’t be easy. Petrie did not gloss over the last three results and he is looking for his team to make a better start to the game at Brechin. Petrie said: “We haven’t been playing well and have also conceded poor goals. “I think our starts in the last three games haven’t been good – we are normally quick out of the traps so that is something we will have to look at for the Brechin game. That will be difficult as Petrie will have up to five players missing for the game.